Join Us!!! We are looking for someone to help us cover Chilean basketball. Please send us an e-mail. Boston College outgunned Alemana Paillaco to earn the third position in the final standings. Boston College forced 30 Alemana Paillaco turnovers. They looked well-organized offensively handing out 29 assists comparing to just 9 passes made by Alemana Paillaco's players. The best player for the winners was Brazilian Tatiana Castro (-81) who scored 20 points, 9 rebounds, 6 assists and 4 steals. The former international guard Paula Moya (174-90) chipped in 18 points, 5 rebounds and 7 assists. Four Boston College players scored in double figures. At the other side the best for losing team was Kasandra Espinoza (-80) who recorded 11 points and 8 rebounds and Josefina Cortes (174-98) added 14 points respectively. The winner was already known earlier in the game, so both coaches allowed to play the bench players saving starting five for next games. Gimnastico are the Liga champions. They topped Los Leones to finish the Final Four action at perfect 3-0 record. Gimnastico players were unselfish on offense dishing 22 assists. It was a good game for the former international center Tatiana Gomez (192-81) who led her team to a victory with a double-double by scoring 37 points (!!! ), 15 rebounds and 7 assists (on 17-of-22 shooting from the field). Colombian power forward Narlyn Mosquera (197-89) contributed with a double-double by scoring 17 points, 19 rebounds and 5 assists for the winners. American power forward Carmen Tyson-Thomas (180-91, college: Syracuse, agency: Two Points) answered with a double-double by scoring 19 points and 15 rebounds and the former international forward Paola Naranjo (183-78) added 20 points and 12 rebounds in the effort for Los Leones. Urunday Universitario (LUB) added to their roster experienced 34-year old American guard Kyle Lamonte (191-86kg-84, college: William Carey). He started the season at CDU Concepcion in Chilean Liga Nacional. In 22 games he recorded very impressive stats: 19.4ppg, 4.5rpg, 2.1apg and 1.2spg this season. Good year as he was named League Player of the Week. 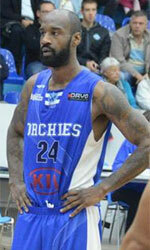 Lamonte ended the last season at La Cancha (Moca Reg.League) in Dominican Rep. league. But the most of that year he spent at Caneros Del Este (LNB) in Dominican Rep. league where in 6 games he averaged 13.5ppg, 2.3rpg, 1.5apg and 1.3spg. The list of the past achievements is quite long as among others Lamonte's team won Colombian Liga DirecTV-1 Group 1 Regular Season in 2014. He was selected to Uruguay LUB All-Star Game in 2017. Lamonte is quite experienced player. His career allowed him to visit three different continents, while he played in seven different countries. Lamonte tasted the life as pro basketball player in Europe, Latin America and of course North America. He has played previously professionally in Argentina (Atenas, Penarol and Olimpico de La Banda), Brazil (Flamengo and Brasilia), Lithuania (Pieno Zvaigzdes Pasvalys), Turkey, Uruguay (Aguada, Hebraica, Olimpia and Malvin), Dominican Republic (CDP Domingo Paulino Santiago and Don Bosco) and Colombia (Guerreros). 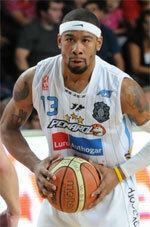 Lamonte is close to retirement age as a player. It's very possible he may end his playing career at Urunday Universitario. Lamonte is a former Eurobasket Summer League player, which is considered top summer league for players who want to play basketball overseas. He attended William Carey University until 2008 and it is his eleventh (!!!) season as a professional player. On Lamonte: An undersized 2 player, who has great shooting accuracy and points production per minute. Gives his best when he attacks the basket inside, in this situation cen be unstoppable. Also, he's a good defensive player, who is very agile but a little limited by his size. The same, he grabs more rebounds than expected. AB Ancud held off CD Valdivia to force the decisive seventh game of the series. American power forward Kwame Alexander (201-90, college: CS San Bernar.) had a double-double by scoring 17 points, 15 rebounds and 4 assists to lead the charge for the winners and international guard Sebastian Suarez (193-91, college: Portland St.) chipped in 27 points and 4 assists during the contest. The best for the losing side was American forward Khapri Alston (196-94, college: Midwestern St.) with a double-double by scoring 23 points and 14 rebounds and the former international forward Claudio Naranjo (191-87) scored 14 points. Both teams had four players each who scored in double figures. Los Leones rallied past Temuco to advance into Liga Nacional Finals. Los Leones made 34-of-40 free shots (85.0 percent) during the game. 30 personal fouls committed by Temuco helped opponents get some easy free throw opportunities. It was a good game for Dominican power forward Manuel Guzman (204-82, college: Bemidji St.) who led his team to a victory with 28 points. American point guard Scott Rodgers (191-87, college: Drexel) contributed with 17 points, 5 rebounds and 4 assists for the winners. American swingman Jovonni Shuler (195-87, college: SSU) replied with 21 points, 5 rebounds and 7 assists and his fellow American import forward TJ Robinson (203-89, college: LBSU) added 17 points and 7 rebounds (on 7-of-8 shooting from the field) in the effort for Temuco. Both teams had five players each who scored in double figures. Temuco beat Los Leones to narrow the deficit in the series. Temuco looked well-organized offensively handing out 23 assists. American forward TJ Robinson (203-89, college: LBSU) orchestrated the victory with a double-double by scoring 27 points, 13 rebounds and 7 assists. His fellow American import forward Abiodun Adegoke (203-91, college: Midwestern St.) contributed with 20 points and 9 rebounds for the winners. American forward Cameron Forte (201-93, college: Portland St.) answered with a double-double by scoring 26 points and 12 rebounds and Dominican power forward Manuel Guzman (204-82, college: Bemidji St.) added 19 points and 6 rebounds in the effort for Los Leones. Four Temuco and five Los Leones players scored in double figures. CD Valdivia held off AB Ancud to take 3-2 lead. Deportivo Valdivia outrebounded AB Ancud 35-20 including 27 on the defensive glass. AB Ancud was plagued by 25 personal fouls down the stretch. American forward Khapri Alston (196-94, college: Midwestern St.) stepped up with a double-double by scoring 21 points and 10 rebounds for the winners and Argentinian point guard Nicolas Ferreyra (185-85) chipped in 25 points (on 10-of-13 shooting from the field). International guard Sebastian Suarez (193-91, college: Portland St.) responded with 32 points and 9 rebounds and American power forward Kwame Alexander (201-90, college: CS San Bernar.) scored 19 points. Both teams had four players each who scored in double figures.